When Chris Messina joined Google in January, just as he turned 29, many were surprised. Why would a guy who'd been so successful in pushing forward the concept of an open and social web give up his independent voice and work for "The Man", as he himself put it? After all, he co-founded BarCamp, helped run the Spread Firefox campaign, proposed the Twitter hashtag, advocated the use of microformats and OAuth and is still a board member of the OpenID and Open Web foundations. Why did he need Google? "I've worked for myself for the last five years, and there are certain things you can do on your own," explains Messina, who recently ranked third in a list of the most powerful voices in open source. "But there were also conversations that you just can't be part of because you don't represent a million users. Trying to bridge communities and bringing people together is great but it actually takes away a lot of the time that you might otherwise use to work on it. I could have spent the next three years chipping away and trying to get them to adopt these things from the outside. But going inside and making some changes by being part of the organisation seemed like a much more efficient way to get to the future many of us want." 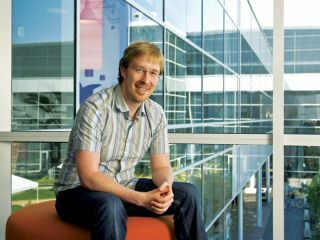 Messina's job title at Google is 'open web advocate', the same title he gave himself a year and a half ago. He works with the social web developer relations team and brings ideas from the community into Google, evangelises them and helps people within the company to understand what's going on. At the same time, he takes ideas that are bubbling beneath the surface at Google and finds ways of socialising and explaining them. Right now, he's tasked with working on the Buzz API. Although Google was widely criticised for the way it integrated its social networking tool into Gmail without addressing privacy, Messina insists Buzz has a lot of potential in the open social web. "Google has a lot to learn in this area for sure," he says. "And they, including me, understand that Google had to do something to get some skin in the game. Buzz is a really good first step in that direction. A very strong, bold step. We're going through a process of rapid iteration to improve the product: listening to a lot of feedback, taking it in, mulling it over and figuring out how to respond." Google has refined the privacy settings in Buzz a few times now. Just days after the February launch, it ditched its controversial auto-follow model for a list of suggested people to follow. And the latest tweak saw a confirmation page popup asking users to double-check their settings and make changes as necessary. Google has also rolled out Buzz buttons and worked to fine-tune the relevance and ranking algorithms for the Buzz feed. However, the goal is not to have everybody on Buzz. "Google will be one node on a vast social web and Buzz just one outpost that's convenient for Gmail users. If we make it possible for people to get their data out, move it around and bring it in from elsewhere, it should inspire others to move in that direction. This will lead to what I hope will be a new generation of social web apps that go beyond just newsfeed-style applications to much richer, contextual, location-based and mobile experiences that today we can't even imagine." The Google Buzz API page lists upcoming support for various protocols, including Salmon, WebFinger, PubSubHubbub and Activity Streams, an extension to the Atom feed format to express what people are doing around the web. It shows that Google is aiming to make Buzz as open as possible.